The Festiva is a mini cutting block, perfect for cutting cheese or fine foods. This cheese board is made of eco-friendly rubberwood, a hardwood known for its rich grain and durability. Below the cutting board is a drawer-style storage compartment that houses four brushed stainless steel cheese tools. The tools include: 1 blunt-nosed soft cheese knife, 1 hard cheese knife/spreader, 1 chisel knife (for hard crumbly cheese), and 1 cheese fork all with hollow handles that fit nicely in your hand. 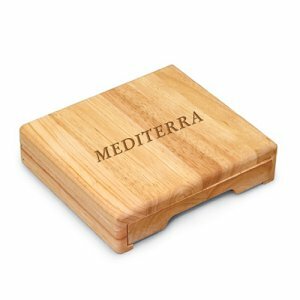 The compact design makes it an easy-to-store and travel item that's perfect for the cheese connoisseur.